Forests with dense canopies create a microclimate that protects a variety of cold-adapted plant species from warming air temperatures, a study has shown. Researchers found plants that favoured cooler conditions fared better under dense canopies than in ones that were more open to the elements. They added that these conditions could be a "critical mechanism" in the conservation of forest plant diversity. A team of international researchers, headed by scientists from Belgium, noted that previous studies had shown that "biological signals of recent global warming" had been increasing across an array of ecosystems. "Around the globe, climate warming is increasing the dominance of warm-adapted species - a process described as 'thermophilisation'," they observed. The team gathered data from vegetation survey from more than 1,400 plots in temperate forests across North America and Europe. In each plot, they compared the results from an original survey with a repeated survey that was, on average, carried out 34.5 years later. The results showed that there had been a sizeable turnover, with about one-third of the species present in the original survey being replaced by other plants. However, they also found that the thermophilisation of vegetation was lowest in forests where canopies had become denser. "These results suggest that recent forest canopy closure in northern hemisphere temperate forests has buffered the impacts of macroclimate warming on ground-layer plant communities, thus slowing changes in community composition," they wrote. As well as lowering temperatures, the dense canopy cover also increased relative air humidity and shade within forests' understorey. The researchers explained that these conditions also offered protection to forest herbs and tree seedlings from summer drought, "decreasing mortality and thus buffering the impacts of large-scale climate change". They noted that in western Europe, a number of factors - such as changes to management regimes - had resulted in increased tree growth and forest densities. "Logging and natural losses of tree biomass have been consistently lower than annual growth increments, resulting in an almost doubling of standing stocks of trees per hectare between 1950 and 2000," they wrote. Temperate forests account for about 16% of the world's tree cover, while understorey plants account for 80% of the flora diversity found in these habitats. 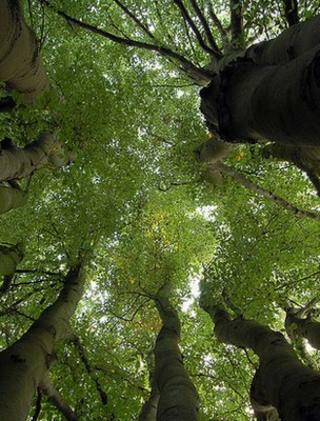 Co-author Keith Kirby, a woodland ecologist from the University of Oxford's Department of Plant Sciences, said the microclimate created by a dense forest canopy allowed some plants to remain within their comfort zone. However, he warned: "The other thing we must remember is that this moderating characteristic only works as long as you have got the canopy there. "At some stage, the trees themselves may die from disease, they may get felled or they themselves might succumb to the effects of climate change. "Once that happens, what we might then see is that the ground flora might start to shift quite rapidly, so we might have things keeping relatively stable for quite a while but then we pass a tipping point once the canopy opens up." After a prolonged post-war hiatus, traditional woodland management techniques - such as coppicing - are becoming popular once again. But Dr Kirby told BBC News that this study's findings suggested that a more considered approach might be needed. He observed: "This might be a case to say hold on a minute because if we start coppicing and opening up the canopies, we will also be exposing these plants to future climate change more. "Maybe in the future we should be reducing the extent that we break up canopies." But he added that perhaps "the gentle intervention" of management techniques was needed in order to strengthen woodlands' resilience to the threats posed by pests, pathogens and extreme weather events.